Where was this photo taken? On my front porch, Hammond, Indiana. 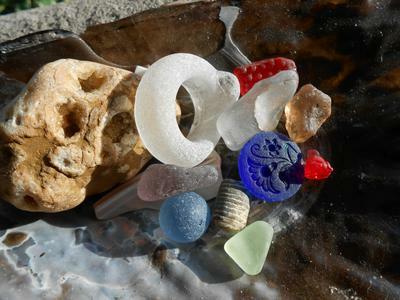 All pieces were found at Whihala Beach, Whiting, IN, on the southern tip of Lake Michigan. 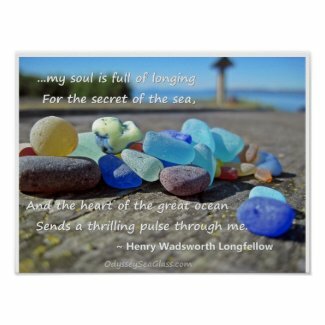 The beach glass was found over a period of years, my favorite pieces. The photo was taken today, June 11, 2016 about an hour before sunset. It is a very hot day, we reached 95, humid and sunny. I love to look at these particular pieces, as they are what I consider some of my best finds. The larger red was my very first red find, super rare on my beach. The blue marble is also my first marble, in nearly ten years of collecting, I had never found one. There is also a UV/Vaseline piece, and a tiny red piece that has a floral motif, although we could never decide what it could have been from. Possibly a small bottle, but it would have to have been a very small bottle. There is also a lavender and a peach, my only peach glass. The clear/white is unusual in that there is some other kind of pearlized glass fused to it. The round, cylinder, stone-like piece is actually a crinoid. Fairly common along the Great Lakes, this is my largest find of this. These date back about 30 MILLION years! The ring is my first full ring find, a handle from a jug or bottle. The large crystal rock I just used to hold things up, but is also one of my favorite finds. And last but not least, my gorgeous blue button. I found this and the marble on the same day, which also happened to be my parents wedding anniversary, so I felt they were watching down on me. All of this rests on a shell I found on a trip to Florida in 2013. I have a basic, point and shoot, Nikon Coolpix S3300. I love this camera as it fits in my bag or pocket and has a macro feature! 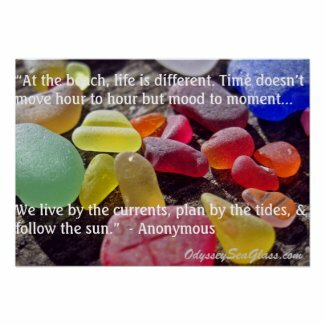 "The Secret of the Sea..."
"At the Beach, Life is Different..."